One of our firm’s greatest strengths is the depth and breadth of our Chicago business litigation practice, including handling remedies in breach of contract actions. Since our law firm’s founding, litigation has been central to the firm’s operations. Whether in the courtroom, in a deposition or at the negotiation table, our Chicago business litigation attorneys are known for their skillful handling of matters. Our lawyers bring thoughtful and practical experience to achieve desired results. When suing for breach of contract, it is important to understand what you want from the breaching party (the “defendant”). The results sought by a plaintiff when a breach occurs in a business contract are referred to as the remedies. 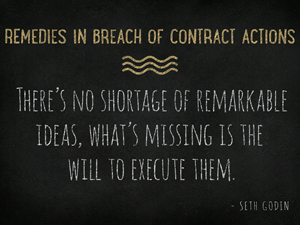 There are a number of different remedies in breach of contract actions. Typical breach of contract remedies include money damages, liquidated damages, restitution, rescission, specific performance, consequential damages. Of course, the remedy available depends on the specific facts of each case as well as the specific terms of the contract. Money Damages are among the most common breach of contract remedies sought. When the court rules that one party has breached a contract, the injured party will often seek an award of monetary damages to compensate for the loss caused by the breach of contract. The money damages typically equal what the plaintiff would have received if the contract had not been breached. Money damages include compensatory damages and punitive damages. Compensatory damages cover the loss to the plaintiff. Punitive damages serve the purpose of punishing the wrongdoer and deterring others from acting in a similar manner. Punitive damages are extremely rare in breach of contract cases, particularly in Illinois, and will not be awarded unless the breach amounts to an independent tort and includes malice, wantonness or oppression. Lost profits can be awarded as monetary damages if they can be estimated with reasonable certainty. The will not be awarded if they are speculative and/or with little proof. When damages are difficult to determine, the parties will often include a liquidated damage clause in the contract. Liquidated damage clauses specify the non-breaching party’s remedy in the event of a breach. Typically, liquidated damages clauses specify the amount of money that will be paid in the event of a breach. These are damages that the parties agree to pay in the event of a breach. Liquidated damages clauses are commonly upheld if they are determined to be fair. Restitution is designed to restore the plaintiff to its pre-contract position. Rather than compensation for losses, a party seeking restitution will seek to reverse the contract and return property or money given under the terms of a contract. Restitution is used when the court voids the contract, for example, due to a party’s lack of competency or capacity necessary to enter into a contract. A plaintiff in a breach of contract case can also seek to have the contract voided or set aside by the court. This is common when fraud, mistake, duress or undue influence is present when the contract is being negotiated and/or executed. Rescission terminates the contractual duties of both parties. Reformation of a contract is a remedy in which the court restructures or assists with rewriting the terms of a contract to correct problems with the contract. This type of remedy is uncommon as the parties are assumed to be responsible for reviewing and understanding the terms of their own agreements and courts are reluctant to chance the substance of a contract. This is when the court forces the breaching party to complete the terms of the agreement (i.e. perform as they promised in the contract). The remedy of specific performance for breach of contract is most common when money damages are inadequate, the goods or services are unique (rare art, etc.) and no other remedy will suffice. Before you file your breach of contract lawsuit or attempt to defend a breach of contract lawsuit filed against you, you should discuss the case with a business litigation lawyer. Our law firm will review the contract and analyze the facts in order to determine what contractual remedies are available. Our Chicago breach of contract attorneys are available to discuss your breach of contract case. Litigating contract disputes can be difficult, but we are here to help. Our Chicago attorneys have decades of experience in handling cases in state and federal courts throughout Illinois, including Cook, DuPage, Kane and Will Counties. Please do not hesitate to contact our Chicago law firm at 312-789-5676. You can also contact us by email or by providing your information on the right side of your screen to inquire about your case. A Chicago real estate developer was indicted Friday on charges connected to an investigation into Ald. Ed Burke. NBC 5 Political Reporters Mary Ann Ahern and Carol Marin take you back through the week that was in politics.